The disruption was based on “erroneous information,” according to Concordia University, to the community that residents of any district could vote at the LB Building between Oct. 9 and 12. On-campus voting was open to residents of any district only between Oct. 5 and 8. In order to be able to to vote at the LB building over Thanksgiving weekend, voters need to be residents of Ville-Marie–Le Sud-Ouest–Île-des-Sœurs, and have voter information cards listing the LB Building as an advance polling station. The school sent out an incorrect schedule via email on Oct. 8.This email was based on false information sent and confirmed by Elections Canada, according to Concordia spokesperson Chris Mota. Concordia student Michelle Rosinski was one of the people to find out they couldn’t vote on campus. 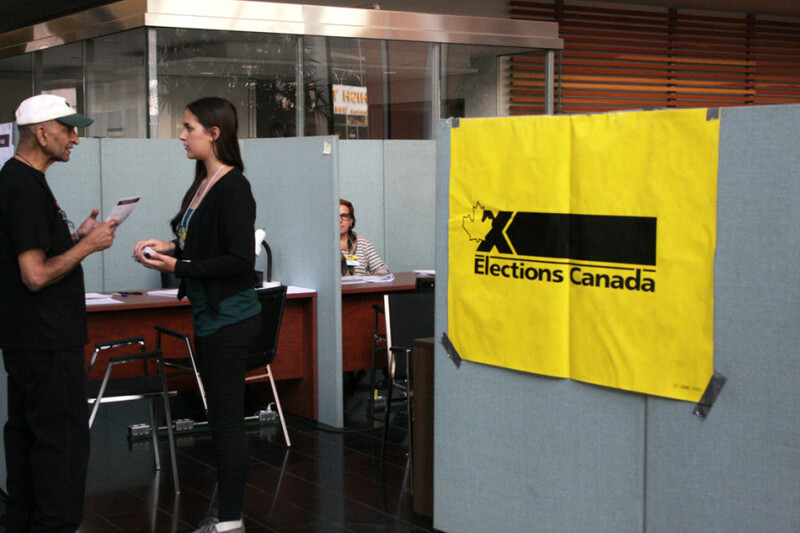 She and a friend arrived at the LB building around 12:30 p.m., and when an Elections Canada employee confirmed that they were students registered in another district, the pair were told that student voting had ended the day before. Rosinski and her friend then showed the employee Concordia’s email indicating their ability to vote on-campus until the 12th. Rosinski said the employee became “concerned,” and left to make phone calls to try and get to the bottom of the situation. Rosinski said that a couple of people from Elections Canada showed up and started setting up a separate booth for her and the 10 or so other students in the same predicament. The Elections Canada staff kept telling them to wait a little bit longer, but after about 40 minutes, she and her friend left without voting. According to Mota, the returning officer for the local district, Louis-Marc Chiasson, arrived on campus to determine what was happening. He saw the initial scheduling information provided to Concordia by Elections Canada, and confirmed that it contained incorrect details, Mota says. Chiasson couldn’t be reached for comment by press time. Although the university sent out this incorrect schedule, the proper information was posted on the Elections Canada website, and had been reported on in a previous story. Mota is unsure how many people were turned away from the polls, but she says she witnessed “a handful” within 90 minutes of being on site. While the scope of this disruption is unclear, Mota emphasized that it is “highly unfortunate” that anyone was affected at all. “If I’m one of those people who wanted to vote, and I was turned away—that’s disruptive,” Mota said. However, she added that if the error was indeed Election Canada’s, she didn’t hold the day’s events against the university. “If that’s really what happened, how could you blame Concordia,” she continued.